i’ve had so much fun being in kalamazoo and cooking with my family. cooking with friends and family is one of my favorite things about food–its ability to create a gathering. 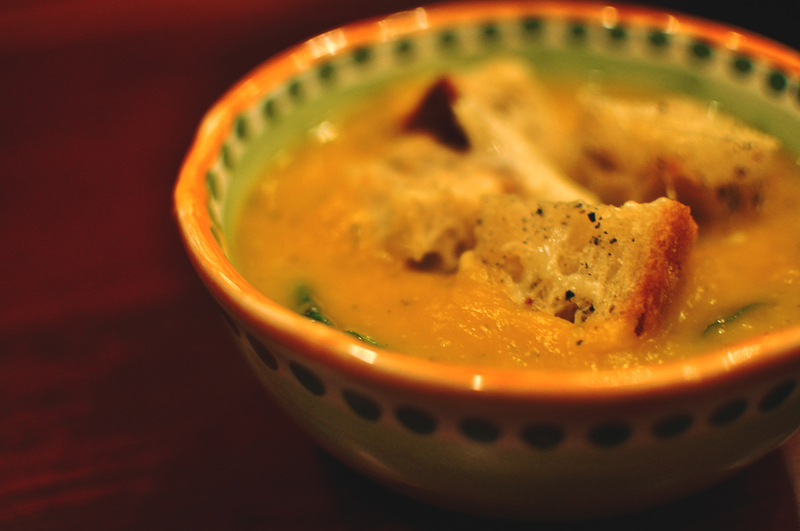 a few nights ago, kate & will came over for dinner and we made butternut squash soup together. my sister is a really talented photographer, so we were not only to collaborate with the recipe, but the pictures as well. butternut squash, about 3 lb. heat the olive oil in a medium saucepan or dutch oven, and saute the onion for 5 minutes. add the cabbage and continue to saute, 5 minutes more. 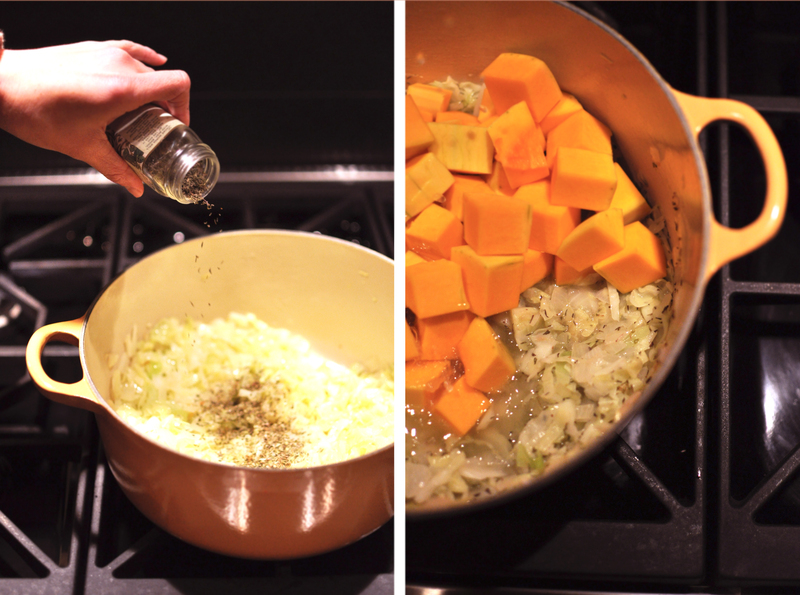 add the herbs, salt and pepper, cubed butternut squash, and broth, then bring to a boil. 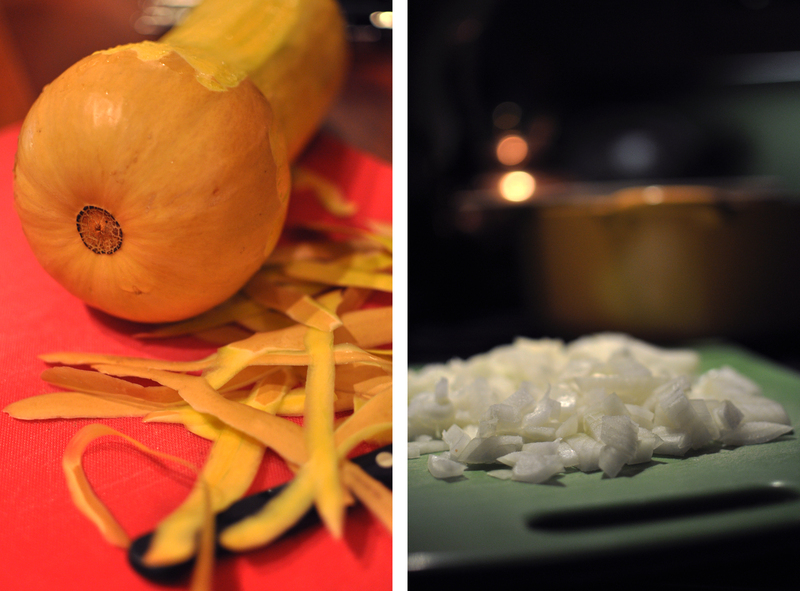 boil, covered, for 10-12 minutes, or until the squash is tender. puree the soup, in batches, and then return to the pot. add the bacon, a few dashes of hot sauce, and the spinach, stirring until it wilts. serve the soup with some creme fraiche or greek yogurt and the gruyere croutons (recipe below). preheat the oven to 350 and line a baking sheet with parchment paper. toss the bread cubes in a bowl with the olive oil, salt, and pepper. spread them out in a single layer, and bake for 10 minutes. after the first ten minutes, remove the pan from the oven and flip the croutons. sprinkle the cheese on top and bake for 10 minutes longer.